John Robinson (4 May 1935 - 6 April 2007) was a British sculptor and co-founder of the Bradshaw Foundation. Accounts of his work may be seen at the Robinson estate website, the website of the Centre for the Popularisation of Mathematics and the June and July, 2007, issues of Hyperseeing. Among other distinctions, he was the Official Sculptor for the British Olympic Committee in 1988, and a University of Wales Honorary Fellow, 1992. Robinson first made a name for himself with representational pieces. His figurative bronzes ranged in scope and scale from life-size commissioned sculptures of children to athletic sculptures, and included a commissioned bust of Queen Elizabeth and another of the Queen Mother. 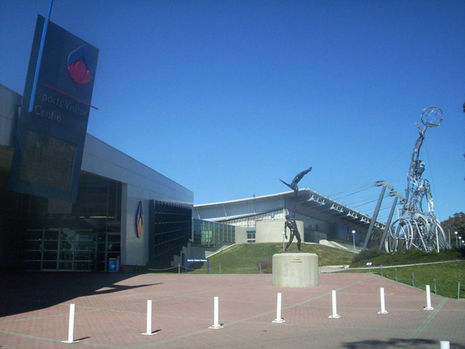 His representational sports figure ‘Acrobats’ (1970, 5 metres) is mounted outside the Sports Academy in Canberra. There are 7 other world placements of the 'Acrobats'. Another of his athletic sculptures, ‘Hammer Thrower,’ may be seen outside the Bowring Building in Tower Hill, London, at the United States Sports Academy, Daphne, Alabama, and in Melbourne, Australia. Robinson was Official Sculptor for the British Olympic Committee in 1988. His ‘Gymnast’ is at the new Olympic Museum in Lausanne, donated by the Australian Olympic Committee.